Versatility: the new pedestrian gate can be specified to lengths as great as 6 feet. This allows them to guard a much wider variety of areas. With two of them properly placed, you can manage aisle access more than 12′ wide. Also, the “protected zone” can be extended to match the length of the arms. This means that to cross an aisle of 10 feet (for example), two gates on opposite sides can open, then extend so that pedestrians are always behind them as they cross. Visibility: The new arms feature an LED strip light, which attracts attention better than a stop sign. 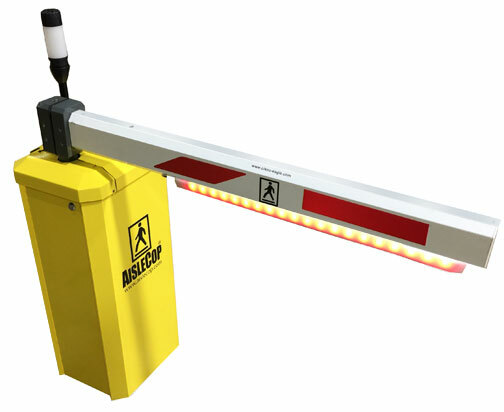 The LED light flashes only when the gate is open, meaning that it will be more apparent to forklift drivers when pedestrians are in the intersection. Maintenance and replacement: These gates are lighter and easier to replace, but have durable aluminum construction. You can choose to use the system to guard a different zone, install it, and order a new arm when you need to. If the gate is damaged, shipping a new arm system is easier and replacement quicker. The previous stop sign hoop gates are being phased out in favor of these lighter, more visible arms and will not be available on new AisleCop® systems. For more information, contact us today.